Alright then. From now on I'll write in English. It is not very polite to write about people and they can't even read what you're writing...I'm presuming everyone can follow English...?! I am allowed to name the couple from France 'out loud' on the internet. Nikki and Jean-Francois are their names. I remember Nikki saying, that first land-looking day, 'this is the second sign it is not the right land'. She was sitting in our car, when the car of the landowners whom we were following to their land, broke down right in front of us, out of the blue. And stubborn as I was, I was still hoping against all odds this was a promising piece of land. So I said something in the line of 'it is their car that broke down, not ours. So maybe it doesn't say anything about us?' But I knew I was grasping at air. The American land owners, a couple, sat in the car with us after this. They both looked quite defeated. Here they were, stuck with a piece of land they didn't want anymore, abandoned by the person who was going to aid them financially in buying this land and on top of all that, their brand new car broke down. Ok then. There we went with our loyal and strong Toyota in 4WD, up the messy road. He had told matter of factly before we left, that the road was cleared yesterday and that the bulldozer that cleared the road had toppled over and fell a bit down the hill. It was still lying there upside down. Just to give an impression of the steepness of this land. It was actually simply a piece of hill. It was a hill with a very bad road and there was not one green piece of gras to be seen anywhere. Everything was brown and withered. When we finally got to a somewhat flatter area (me, Nikki and Jean Francois had the urgent feeling we would rather walk up then drive up, but we obediently stayed put) and got out of the car (breathing a sigh of relief), I understood why the landowners made us buy water on the way there. It was very, very hot and dry on that mountain. There was no way I was going to buy this land. Not even if it would only cost a hundred dollars. Yes it was big. Yes the views were great. But the land felt dead, all the banana trees we saw on the pictures had died, withered away. The wateraccess was from someone else and had to be asked permission for. Nope this was not it. Nikki and Jean Francois were not getting in the car again and went of down the hill on foot. The only one happy and jumpy, was Beer. He really felt like hiking to the top. He also really liked the American 'hillbilly' (as he called him). The really funny part of the story is that next day a Swiss couple actually bought this land. Really. Not kidding. When we went looking for the second land, our realtor, Diana, assured us in Spanish that it really was beautiful and green this time and had its own water access. Also; it had more flat area's and was not steep. Nikki and Jean Francois dutyfully came along. This time Lem also decided to come along, next to Beer. When we left the house he said 'I am going to regret this...' and he did. 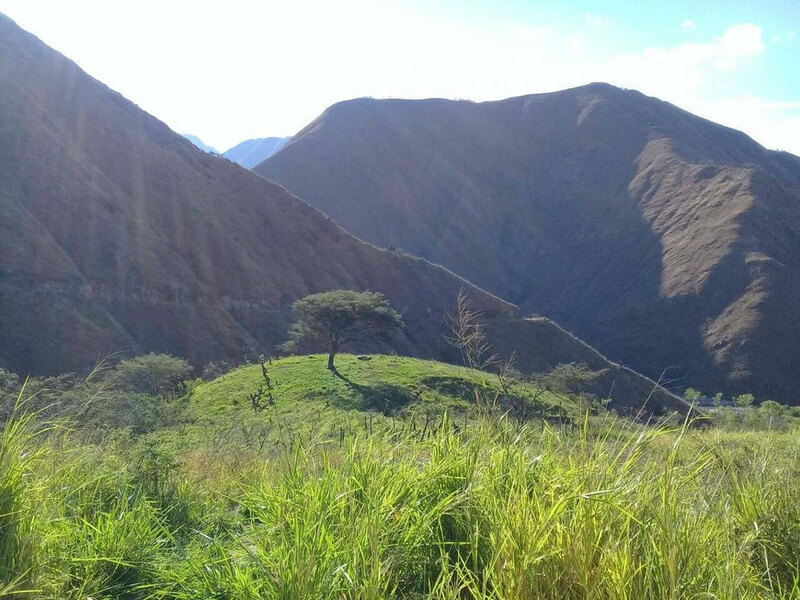 It was not extremely remote this time; 20 minutes out of Vilcabamba. The area, when we neared it, was clearly lush and green. There were flowers everywhere and a beautiful river in the center of it all. The drive was amazing, with the scenery. But the land had a good feel, it went right down to the big, clear and clean river. There were all kinds of trees (banana, citrus, coffee, avocado, etc) and other crops. The irrigationsystem had gotten out of hand a bit; water was flowing everywhere -very uncoordinated- over the land, while other pieces were dry with cracked clay. I almost slipped in the soaking wet areas of clay, trying to find my way. I liked it very much, but it was simply undo-able. The flat areas were not big enough, the land was messy and there were no roads on the land. The irrigation water came from the mountains and was shared between 120 people. The nephew had to cross the land daily to get to his land and on and on the list of negatives went. To make this land in any kind of shape to live on, with a lot of people, we had to spend a lot of money and a lot of work on it. It hurt a little bit to let it go, since I truly loved the feel of the valley. Nikki confronted me -while walking back to the car- with the question what it was I was actually looking for in land. I tried to explain again that it all came out of meditation and that I had to feel about it, not think about it. Also; I wanted to do this together with others (her for instance!). Any land I wanted to buy with others. Not by ourselves. I wanted to have all their opinions, talk about what we all wanted and make the decisions together. It had to become a village, not a one-couple-thing. She looked seriously at me, but gave no comment. The no-see-ums were coming out again now the sun was setting, biting us were we stood, so we left the conversation at that point. Also; Lem was complaining about the walking ('I already knew I was going to regret this! '), his tiredness, his 'out of breath-ness' ( "have always had bad lungs!' strange that I never noticed, being his mother? "you just never notice me!") and he felt like puking from tiredness. He also wanted to rest on me. So there was no more space for serious thinking or talking. Eventually Beer caught up with me and Lem (he had taken the scenic route) and he took Lem on his neck for a little. "You are my hero!" Lem told Beer. I will remind him of these words next time he hates his brother. We brought everyone home after this. After these land visits it becomes even more clear to us that we have to start by settling in. Jean Francois, whose Spanish is pretty good, helped us explain to Diana that we should focus more on finding another rental for 6 months, then on looking at too many properties. We will keep our eyes and ears open and in the mean time we will settle into this versatile land. The photo down here is taken by Beer during the last land visit on Friday. He loved the image of the lone tree on the hill.